When the body of a young heiress is found within the Royal College of Surgeons, Detective Sergeant Jamie Brooke is assigned to the case. She enlists Blake Daniel, a reluctant clairvoyant, to help her discover the message it holds. When personal tragedy strikes, Jamie has nothing left to lose and she must race against time to stop the mysterious Lyceum claiming another victim. As Jamie and Blake delve into a macabre world of grave robbery, body modification, and the genetic engineering of monsters, they must fight to keep their sanity, and their lives. 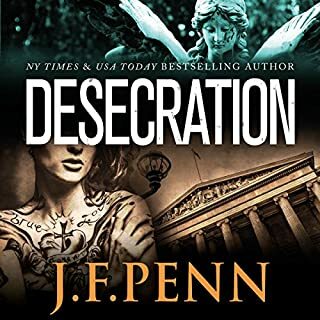 Desecration is an intelligent, fast-paced thriller, but the author goes much deeper than familiar genre tropes to produce thrills and chills. The book deals with the bizarre subculture of body modification and delves into the world of corpse art. I have no idea if corpse art is a real thing, but Penn has me convinced it is. Despite its subject matter, Desecration is never needlessly graphic. Certainly, it is ghoulish and macabre at times, but Penn treats death with respect rather than merely as a device to evoke fear and heighten tension. Detective Jamie Brooke is assigned to a murder that took place at the Royal College of Surgeons. The assignment comes as she is standing at the bedside of her terminally ill daughter. Death itself is an ever-present character in Desecration. Jamie Brooke is one of the most fully developed, multi-dimensional detective characters I have ever read. The narration and the writing blend seamlessly to produce a fully immersive experience that is both thriller and mystery.